A selection of 10th to 16th century embroideries from the Newberry collection at the Ashmolean by Marianne Ellis (published Oxford, 2001). In the 1940s Professor Percy Newberry gave the Ashmolean Museum a collection of almost 2300 textiles that he and his wife, Essie, had acquired in Egypt. They range in date from the 10th to the 19th century; and among them are more than a thousand Islamic fragments. Most of these are decorated with embroidery, but there are also some woven striped silks, a few painted fabrics and a piece of knitting. When they came to the Ashmolean Museum in 1946, most of the fragments were stuck onto large portfolio sheets. Accompanying a few, in Professor Newberry's handwriting, were brief pencilled comments regarding the stitch, possible date or place of origin. It is likely that these textiles were Professor Newberry's special interest, as he was a distinguished Egyptologist who spent much of his working life in Cairo; However, they were only part of a larger collection of embroideries that he and his wife had assembled. These included Ottoman, Greek Island, Balkan, Persian, Algerian, Moroccan, Syrian and Central Asian pieces, the majority of which are now in the Whitworth Art Gallery in Manchester. Essie Newberry also gave some especially attractive and finely worked items to the Embroiderers’ Guild to add to the portfolios loaned to members to study and enjoy. Her interest and expertise in embroidery was widely recognised, and it was she who was asked to repair the linen pall embellished with marguerites of gilded bronze that had been found in Tutankhamun’s tomb. She served on the Executive Committee of the Guild for many years and her enthusiasm and love for the craft were instrumental in the expansion of the organisation. In their lifetimes the Newberrys encouraged others to share their interest in historical ernbroideries and enjoy their unique and wonderful collection. The embroideries illustrated in this book are from the Tulunid period (A.D. 868-905), Fatimid period (A.D. 969-1171), the Ayyubid period (A.D. 1172- 1249) and the Mamluk Sultanate of Egypt and Syria, ending with the Ottoman conquest in 1517. The majority date from the Mamluk period, during which embroidery was used to decorate a wide range of textiles. The Newberry collection is most unusual in that it contains sufficient examples to give us a glimpse, if not a complete picture, of the textile production at these times. Accurate dating of the examples illustrated is in fact difficult. Two tiraz fragments are dated by their inscriptions (cat. 1, 2). A second group has been approximately dated through radiocarbon, the work being done at the Radiocarbon Accelerator Unit in Oxford University. The fact that the radiocarbon date of the tiraz piece (cat. 2) is at variance with its inscription indicates that all is not as straightforward as one might have hoped. Most dates, however, depend on stylistic comparisons; the wide dating parameters given for most of these pieces illustrate the difficulties. Dating might have been more precise if the pieces had come from scientifically recorded excavations, but as far as we know they were purchased from dealers. In an article written for the journal Embroidery in 1940, Essie Newberry recorded that the textiles came from graves and from the rubbish mounds of al-Fustat and Old Cairo, in the southern quarter of the city, and that the greatest number were acquired in the 1920s and 1930s. Professor Newberry left a notebook in which he recorded places from which a few of them came, but it is impossible to know whether this information was personally known to him or supplied by dealers. He also wrote some locations on the portfolio sheets and occasionally there are tantalislng clues, such as the label on the back of sampler marked “Fustat 14.7.32” (cat. 13) and a note referring to a splendid depiction of a lion, or possibly a leopard, in appliqué work that reads “found on the rubbish heaps of Old Cairo”. Most of the embroideries are apparently from light clothing and furnishings, but many of them are fragments, so it is difficult to identify exactly what garment or cloth they once decorated. Inevitably they have suffered from damage caused by the conditions in graves and rubbish mounds; this has been compounded by the way illicit excavators or dealers cut the embroidery from the plain sections of the textiles. The majority of the items have a linen or cotton ground fabric, embroidered with silk thread. The quality of spin and weave is generally good, and the linen has often been carefully bleached, suggesting that the textiles were for everyday use by prosperous middle class citizens. Those from the Mamluk period show us that needlework was used widely to decorate all manner of garments including tunics, the ends of trouser legs, girdles, waist tie-bands, scarves, caps, slippers and kerchiefs kept in the wide sleeves of the tunics. Items of household linen were also embroidered and include towels, pillow covers, and cloths of different shapes and sizes used as wrappers and covers. Many such cloths were required for household use to act as dust covers for all manner of objects including trays, baskets, cooling jugs for water and ceramic jars of the type known as albarelli or drug jars. Cushions were essential to provide comfort in homes which did not use chairs or beds. In Mamluk paintings curtains are depicted knotted or drawn aside and evidently played an important part in the interior furnishings as wall-hangings and room-dividers. Two of the more unusual items in the collection are tabs which were hung as ornamental edges around tents and canopies and an embroidered cover for a padded glass bottle. Many of the embroideries are worked in geometric patterns but there are also examples of scrolling and arabesque designs, figurative motifs and calligraphy. Beautiful writing is considered a major art form in Islamic culture, and the collection includes an embroidered tiraz band (cat. 2) from Iraq or Iran with an elegant flowing script worked in a variation of chain stitch. In complete contrast, the forms derived from letters on some pre-Mamluk fragments (cat. 6, 7), have become illegible repeating patterns contained within compartments; this ordered arrangement of two patterns alternating along a band continued in use throughout the medieval period. Sometimes calligraphy was set against an intricate background of decorated scrolls and interlaced knots (cat. 9). Examples from the Mamluk period have words repeated as patterns like “glory” on a roundel (cat. 40) and the phrase “glory and eternity” on a long strip of linen (cat. 48). A motif which occurs with slight variations on no less than nine of the embroideries is derived from Arabic letters (cat. 18, 55); the frequency with which it appears suggests it was a 'good luck' symbol. It is one of a number of Islamic designs included in Western European pattern books published in the 16th century. The collection provides several interesting parallels between Newberry examples and pattern book illustrations, raising the question of how much European amateur needlework owes to Islamic Egyptian medieval embroidery. More evidence of its influence is also clearly shown on designs and stitches on later Greek Island embroidery. The number of figural images may cause surprise, but whereas theological disapproval prevented their use for Quranic illuminations, religious architecture and furnishings, they can be seen on many objects for personal use. We find attractive animal and fish motifs worked on the embroideries but birds were by far the favourite subjects. They can be seen on tapestry-woven textiles before and after the arrival of Islam and feature on embroideries dating from the 12th to the 15th century demonstrating some of the different ways designers and embroiderers chose to portray them. The treatment of a paired bird and tree design on an embroidery from a 10th or 11th century band (cat. 3) affords an interesting comparison with that on a 15th century one (cat. 30). Convention dictated the stance of a small lion with raised front paw and upright curved tail (cat. 40) because this is a heraldic device associated with Sultan Baybars (d. 1277). Heraldic motifs and other design parallels between Mamluk objects occur across the media including glass, ceramics and metalwork; it seems as if the craftsmen drew on a common fund of decorative themes. Many of the embroidery designs from the 12th century onwards in the Newberry collection are geometric in character often a regular repeat of a unit of pattern. We see straight and angular lines zigzags and hooks replacing the curves on earlier embroideries; for instance, it is noticeable that the earlier curvilinear S and reverse S forms have become rigid S- and Z-shapes. Some forms are new such as the large and small cartouches in the shape of elongated hexagons, whirling rosettes, double pointed arrows and eight-pointed stars. These were arranged in seemingly endless combinations made more complicated by the introduction of mirror image repeats and counterchange compositions. There are some beautiful examples of arabesque and stylised floral or plant-like designs. While these are fewer in number than the geometric ones, we cannot make any assumptions as to whether this is a true reflection of the needlework produced at this time or because such embroidery as survived was fortuitous. The use of design or stitch on its own as the criterion for classifying the embroideries is not satisfactory because it is not sufficiently selective. However it is fascinating to see that pieces sharing both the same types of design and stitch fall into groups. In this book examples from these categories are described and illustrated but the order in which they have been arranged can only be approximately chronological; some of them were contemporary with each other and many factors remain unknown, such as whether they were produced over a short or long period of years. By far the largest number of fragments is embroidered in 'counted thread' stitches, These include pattern darning in running stitch, double running, and close counted herringbone stitches worked over and under a predetermined number of threads. The collection contains many samplers with patterns for such counted works and sometimes identical designs can be found on other fragments in the collection (cat. 26, 36, 37). Each of the counted thread stitches has its own particular qualities, so the reason why a particular stitch was chosen depended on such factors as the visual effect, utility and the amount of labour involved. Sometimes combinations of different techniques were worked on the same embroidery. In general earlier examples used fewer stitches, often employing just one type, whereas as marry as four can be found on later more intricate work. For example, on a 14th century sampler (cat. 28) we see a simple form of drawn-thread work, while a variety of stitches producing both pulled and drawn-thread work were used on embroideries dating from at least the 15th century and possibly earlier. It is likely that these comparatively simple openwork techniques, imported to Italy via trade, became the basis for the development of needlelace in Europe. The size and direction of the stitches worked on counted thread embroidery are limited by having to stitch over and under a chosen number of warp and weft threads, whereas no such constraints are imposed on freestyle work where the size and direction of the stitch can be varied at will to suit the marked pattern. We find linear designs worked in such fundamental stitches as stem and split stitch, with a variation of the latter producing a jagged line (cat. 43). An example of a successful adaptation is the way slanted buttonhole stitch has been used to interpret a beautiful flowing arabesque design (cat. 42). When stitches are analysed it becomes apparent that many are simply variations of fundamental ones; the fascination of studying embroidery techniques is in trying to discover the reason why such variations developed. 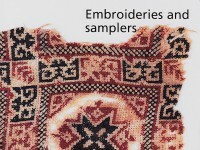 The presence of interlaced herringbone stitch on some fragments raises the question of whether these were worked in Cairo by Armenians, for whom this stitch is traditional, or whether they were imported (cat. 53). Both patchwork and quilting are represented by some particularly fine examples; inlaid patchwork has been used to interpret a striking design with great effect (cat. 50) and onlay patchwork to create a charming little silk cap (cat. 65). Its silk patchwork and linen backing were quilted with parallel diagonal lines of running stitch and adorned with motifs composed of tiny eyelets in buttonhole stitch. A type of cord quilting, known as 'ltalian', was used to form a raised pattern of diamonds on the band of a cap (cat. 64). In her article published in 1840, Essie Newberry remarked that these stitches and techniques were well known to the embroiderers of her day and the same is true some sixty years later. Fortunately for us, both Professor Newberry and his wife appreciated the value of these archaeological textiles that amazingly survived the hazards of burial, rushed excavations and the hands of dealers to show us some of the skilful and diverse ways embroiderers decorated textiles in Islamic medieval Egypt with a wide variety of designs and patterns. Ibn Khaldun, the ldth century Arab historian wrote that “all crafts are customs and colours of civilizations” and that when the culture falls into ruins “only people who know are able to discern these remnants [of the culture]. They will find, however, traces of the crafts [there] showing what once existed there, like faded writing in a book."